Jim Carrey is back on TV, just for Kidding. Getting Carrey, whose last on-camera series regular role was on In Living Color in 1990, to do a series television again was no small feat and it came down to one person: Michel Gondry. "Well, he, for me, was the linchpin. I was incredibly interested in the material, but when Michel came on board, I thought, ‘I get to go play with a teammate, and that's really wonderful.' 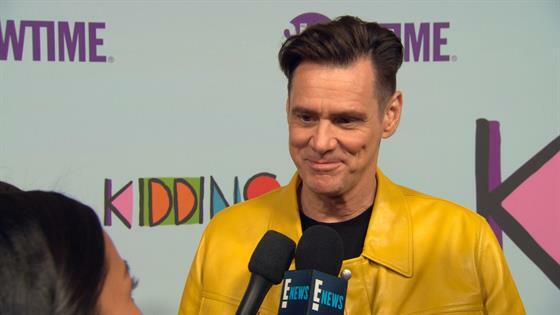 So it was a thrill," Carrey told press at the 2018 Television Critics Association press tour. Gondry, who is a director and executive producer on Kidding, and Carrey previously worked together on the critically-acclaimed flick Eternal Sunshine of the Spotless Mind. It was on that movie that the two learned to trust one another and have faith in their methods. "So trust has happened, and I think anybody creative who is honest has electricity between them, and we have that for sure. But he was surprised a couple times," Carrey said. "He came up and said, ‘You're not arguing with me. What's happening?' And I said, ‘Oh, I guess I like the ideas.'" Kidding stars Carrey as Jeff, better known to the world as Mr. Pickles, a beloved children's television personality. Think modern-day Mr. Rogers. However, under the surface there's pain. Mr. Pickles is a happy-go-lucky TV personality and underneath that is Jeff, a man who has experienced great trauma and seen his life, off screen, fall apart. "The fact is, any changes freak people out when they've got something successful that they've been doing. There's a change in the makeup, somehow the chemistry of the show. First of all, what happens is so challenging that I would think that everyone would assume that there will be a nervous breakdown. And it might not even be that. It might be them who is having a nervous breakdown. That's the wonderful thing about this show," Carrey said. "I think we're going to be on a journey to find out that everyone is going through the same change and they're being forced to by circumstances." Change is something Carrey said he wanted in his career. "You always have to talk everybody and yourself into the next step, whatever it is. I mean, it's just, you know human beings, when something works, their instinct is to grab onto it and don't change a thing and stay with it as long as you can," he said about jumping around genres. "I've never felt comfortable with that." The series also stars Frank Langella, Catherine Keener, Judy Greer and Cole Allen. Kidding premieres Sunday, Sept. 9 on Showtime.